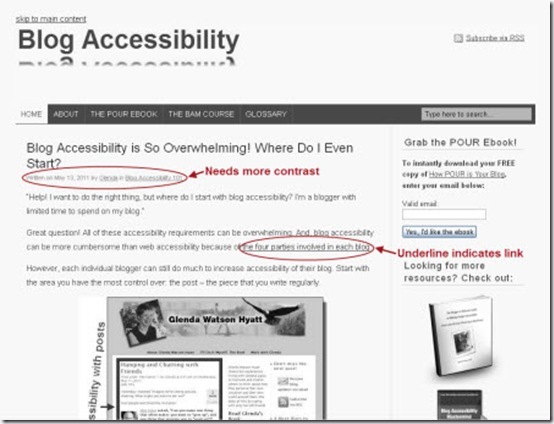 Digging into my Web Accessibility Toolbox, the grayscale conversion accessibility tool GrayBit converts a webpage into grayscale to ensure there is sufficient visual contrast between elements. Sufficient colour contrast is essential for improving readability. The post credits – the date, author and category right below the post title – needs greater colour contrast to improve readability. Underlined hyperlinks is what makes the links visible. The different font colour is not noticeable in grayscale. Try entering your blog URL into GrayBit. How does it fare? Are any elements difficult to see or to read? Are any changes needed?